Qatar Airways offers what is probably the best narrow-body business class experience. Although the seat is not lie-flat, it sure is better than the seats offered by most airlines in their narrowbody fleets. The soft product was top notch and the service was amazing. Having the whole cabin to yourself is also pretty nice! The Good: All the soft product related details were wonderful. The Bad: The seat was not lie-flat, but that didn’t matter much. 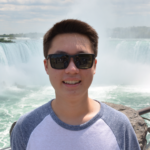 The Noteworthy: I was all alone in the business class cabin, and that was AWESOME. After spending a day in Colombo, I headed to Colombo’s Bandaranaike Airport. When I arrived there on my Sri Lankan Airlines flight, the airport seemed pretty quiet. When I got there that morning, there was a lot more hustle bustle going on. Check-in at the Qatar Airways counter was efficient, and I then proceeded through passport formalities with my boarding pass. 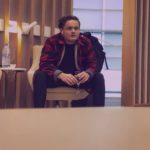 I arrived a bit later than I intended, so I spent a very short time in the Qatar Airways contract lounge. It was a very sub-par lounge used by a variety of different airlines. At CMB airport, you go through “security” at each gate, therefore the main terminal isn’t properly a secure zone. I did not feel unsafe in the terminal, but once you enter your gate, you are stuck there. My flight was scheduled to depart at 11:25am, and the gate opened up about at 10:30. Once past the security check, I decided to sit and try to see any interesting incoming flights. The only aircraft I saw arrive were an Oman Air 737, and the delayed Qatar Airways A330, which (according to FlightRadar24) was delayed about 6 hours, yikes! Boarding began at 11am, with Business class boarding first. It is worth noting now, that there were still people coming through security as they announced boarding. I was the first passenger to board, and took the chance to take photos of the business class cabin. Qatar Airways’ A320s have 12 business class seats in a 2×2 configuration. The seats are electronically controlled, and have much more legroom than the average business class seat in the US. The seats also have leg rests and deep recline. Each seat had a bottle of water, a pillow and a blanket waiting for each passenger. The seat controls were on the outer side of each seat, and the table on the same side. Seats had an IFE screen in between them, as well as an IFE control. The cabin was ample and the burgundy upholstery made a good contrast with the white/cream accents of the cabin itself. The tray table was faux marble, and it gave it a touch of classiness that you don’t often see in an A320. As I mentioned above, there was a large pillow and blanket waiting for me at the seat. There was one for each seat, and one of the overhead bins had a few extra blankets (probably from the incoming flight). As soon as I was settled in, the purser, an extremely kind woman from Spain, brought me a small amenity kit and noise cancelling headphones, and informed me that I would be the only passenger in business class today. WOW! I have never had that happen on any flight I’ve taken, it was a real treat. She asked me if I wanted a drink before departure and I requested Qatar’s signature drink (a mint lemonade) which she brought with a warm towel. 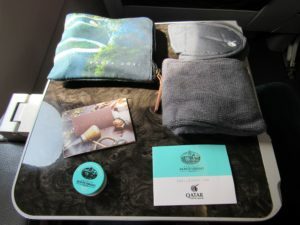 The amenity kit itself was small, and pretty useless beyond the flight, but the amenities inside were more than what I would have expected for such a flight. There was an eye mask, socks, and lip balm. When everyone was on board, the captain came on the PA system to advise us of our flying time, and wished us a pleasant flight. Then, the Muslim prayer was played over the Overhead screens, and the safety video was shown. Taxiing out of our gate I saw a Kuwait Airways A330 and an Emirates 777, among other SriLankan Airlines aircraft. After takeoff, the flight attendant brought over a menu along with a drinks list. Meals in Qatar Airways are dine on demand, and with the cabin to myself, I could have anything on the menu without fear of it running out. 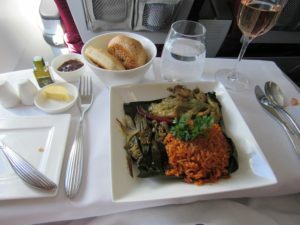 Meal service on Qatar Airways is an event in and of itself. I ordered the non-alcoholic champagne, which was surprisingly good, and it came with a ramekin of warm nuts. Then, the FAs prepared my table, with a bread basket and salt and pepper shakers. For the soup course, I ordered the tomato soup, which was excellent and more robust than I was expecting. As an appetizer, I ordered a chicken curry skewer with tomato chutney, as well as a zucchini with a potato salad on top. For my main course, I ordered the Biryani, which was delicious. For dessert, I ordered the cheese plate. Once I was done, the flight attendant came by with a box of Godiva Chocolates and a cold towel. After the meal service, I requested that the light be turned off. I recline the seat and watched some TV for a while. I dozed off for about an hour and a half. When I woke up, the flight attendants asked if I wanted coffee, and they brought me a fresh latte with biscuits. As we approached the Arabian Peninsula, we had breathtaking views of the coast. Before arrival, I requested to have the raspberry sponge cake as a snack, and although t a bit dry, the flavor was excellent. We hit a bit of clear air turbulence on approach, but nothing major. We landed on time, and were parked at our remote stand in no time. Upon deplaning, there was a luxury bus waiting for business class passengers, so just me in this case. I said farewell to the crew and the aircraft and proceeded to immigrations and connections at Doha Airport. Premium Cabin Shuttle, All for me! WOW! Qatar Airways is not only excellent on long haul routes, but blew me away on this short haul flight. The food was really good, the service was attentive and polished, and you can’t beat having a cabin to yourself. The amenities were also top notch, for a short flight, and the seats were comfortable enough for such a short flight. I hands down recommend Qatar Airways, can’t wait to fly them again! PreviousHow dangerous is turbulence when flying as a passenger?